"In the place of liturgy as the fruit of development came fabricated liturgy. We abandoned the organic, living process of growth and development over centuries, and replaced it—as in a manufacturing process—with a fabrication, a banal on-the-spot product." NCE UPON A TIME, there was a young man who grew up in a large family. He was the third of eleven children. He had a great sense of humor, and he was very devoted to prayer—so much so that he decided he wanted to become a priest. Just at the time he was beginning his studies to become a Jesuit priest, though, a new ruler came to power in his country. This new ruler wrote new laws into the country’s constitution that were specifically designed to suppress the public practice of religion. Article 3 of this new constitution mandated secular education in schools, prohibiting the Church from participating in primary and secondary education. Article 5 outlawed monastic religious orders. Article 24 forbade public worship outside of church buildings. Article 27 restricted the rights of religious organizations to own property. Article 130 made it illegal for priests to dress as priests and denied them the right to vote. Because of these new laws, the Church was basically forced to go underground. As a result, the young man who aspired to become a Jesuit was sent to another country to complete his studies and be ordained. A few years later, when he became a priest, he returned to his home country. The way he went about being a priest was very different than the way I go about being a priest. Whereas I walk and run and drive around the Parkwood Manor section of Philadelphia trying to bring the Gospel to our neighborhood as publicly as I can, this young priest had to do things differently. He went to visit and minister to his people in their places of work, but he had to wear costumes so he wouldn’t be discovered. He would gather people in small groups in basements and attics to celebrate Mass for them. He heard their confessions while walking covertly in the streets. The local police became aware that there was a priest secretly operating in this particular area, so they sought him out. They eventually discovered him and arrested him. Then, without even the pretense of a trial, it was decided that he should be executed. He was led out of his prison cell and taken to a courtyard. A guard asked what his final wish would be, and the priest said he wanted to pray. So he knelt down for a moment on the ground, praying for his family, the guards, and for the conversion of the ruler who had imposed the new laws. When he stood up, he stretched out his arms to his sides, in the shape of a cross, clutching a rosary in one hand and a crucifix in the other. As the firing squad took their aim, he yelled out, “Long live Christ the King!” And he was shot to death. Fact or fiction? Is that a fairy tale, or is it a true story? It is, in fact, a true story—down to every detail. When do you think it happened? Where could something like this happen? Maybe around the time of Nero’s persecutions in Rome? Perhaps in the era of English recusancy? Maybe around the time of colonialism in West Africa? No—this all happened in Mexico in the 1920’s. The name of the cruel ruler was President Plutarcho Calles. He instituted his new laws persecuting the Church in the Mexican Constitution of 1917. And the name of the young priest was Miguel Pro, whom we now call Blessed Miguel Pro. Does all this surprise you as it surprises me? This didn’t happen a million years ago in a distant, unknown land. This happened less than a century ago in a country with whom we share a border. There are people alive today who knew Blessed Miguel Pro. There are photographs of his execution. I am inspired by this story. It motivates me. I admire the extraordinary zeal of a young priest on fire with the faith. 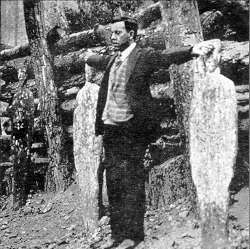 Even in the face of abject persecution, the Mexicans who remained faithful to Christ and led the Cristero counter-rebellion are a model for us. They teach us fidelity to Christ above all else. It’s not merely coincidental that the Solemnity of Christ the King was established by Pope Pius XI—in the 1920’s. This story and this solemnity teach us that Christ, alone, must be our King: not a government or a president, not “financial security”, not secularism, not sports, not alcohol or drugs, and not ourselves. There is room for only one King on the throne of our hearts, and we must zealously guard that seat for Christ. Friends: if this could happen in 1920’s Mexico—a place that had long been one of the most Catholic countries in the world—it could happen again. Even in “the land of the free and the home of the brave,” we are confronted every day with the dictatorship of relativism and secularism. We live & breathe & work in an atmosphere that can be toxic to faith if we allow it to be. Instead, may we have the spirit & energy & faith that animated Blessed Miguel Pro! May every heartbeat of ours reecho his stirring last words: Viva Cristo Rey!